Powers/Abilities: Unrevealed. Presumably, he has the same abilities as his predecessors, including athletic-level speed and agility, as well as poison-filled spikes on the tips of his boots. The origins of this Tarantula are unrevealed. (Get Kraven#1) - Tarantula was present at one of the various Bars with No Name. 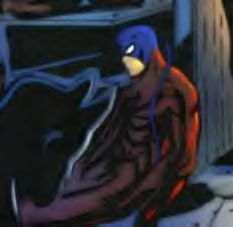 When Spider-Man arrived, several of the villains present attacked him. They were fought off by Spider-Man and Alyosha Kravinoff. Injured, Tarantula hobbled out the door alongside Electro. (Runaways II#7 (fb)-BTS ) - Tarantula ran afoul of the Runaways in Van Nuys, and was defeated after their leader Nico Minoru used a "fumigation/debugging" spell on him. Comments: Created by Ron Zimmerman, John McCrea and James Hodgkins. This Tarantula showed up as a background character in the Get Kraven series, though both known characters wearing that outfit were deceased. A couple of years later, Brian K. Vaughan wrote a throwaway line in his Runaways book about that team defeating "that new Tarantula." While doing preliminary work for other projects, I asked BKV if the two could be the same character, and he graciously allowed us to do so. Profile by Madison Carter and Mike Fichera.